The Plasticine Poetry Series will be meeting again this June on the 15th. This reading will be hosted by the charismatic David Bateman and will feature Jeff Cottrill, Kate Marshall Flaherty, Sonja Greckol, Jim Johnstone, Marni Van Dyk. 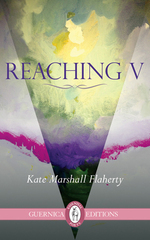 Kate Marshall Flaherty is the author of Reaching V, recently released by Guernica Editions this spring. She has also been published in journals such as Descant, CV2, Freefall, and the Windsor Review. She was short-listed for Nimrod’s Pablo Neruda Poetry Prize, the Malahat Review Long Poem and Descant’s Best Canadian Poem. She lives in Toronto with her husband and three spirited children, where she guides yoga/retreats/writing workshops. Jim Johnstone is the recipient of a 2008 CBC Literary Award and the EJ Pratt Medal and Prize in Poetry, and his work has appeared in periodicals such as The Antigonish Review, Descant, The Fiddlehead, Grain, The Malahat Review, Prairie Fire and Prism International. He is the co-founder (with Ian Williams) of the literary journal, Misunderstandings Magazine. His book The Velocity of Escape was published by Guernica Editions in 2008. Tagged with Jim Johnstone, Kate Marshall Flaherty, Paupers Pub, PLASTICINE POETRY SERIES, Reaching V, The Velocity of Escape.